Opioid peptides have recently been shown to control bladder reflexes by tonic enkephalinergic inhibitory mechanisms in both the brain and the spinal cord. Intraperitoneal administration of naloxone, an opiate antagonist, to ananesthetised chronic spinal cats enhanced reflex contraction of the urinary bladder and induced micturition. The effects of naloxone and thyrotropin-releasing hormone (TRH), another opioid antagonist devoid of the anti-nociceptive property, were investigated in patients with a neurogenic bladder due to acute and chronic spinal cord injuries. Naloxone (0.4 mg i.v.) decreased the intravesical volume at which detrusor reflex occurred from 498 to 346 ml in patients with chronic neurogenic bladder due to suprasacral spinal lesions. A significant rise in detrusor pressure during bladder distension (15 plus minus 6 cm H2O) and a decrease in compliance (17 plus minus 6 ml/cm H2O) were observed, following intravenous administration of 10 mg of naloxone to eight traumatic paraplegics in spinal shock. TRH (2 mg i.v.) produced a significant rise in detrusor pressure along with a significant decrease in bladder compliance in 7 patients with spinal cord injury during the spinal shock phase. A significant reduction in the intravesical volume at which the detrusor reflex occurred (113 plus minus 29 ml), together with a decrease in compliance by 3 plus minus 2 ml/cm H2O was observed in six patients with chronic neurogenic bladder following 2 mg of TRH administered intravenously. The plasma beta-endorphin levels in six cases of spinal cord injury during the spinal shock phase was 28.7 plus minus 3.53 pmol/l as compared to 5 less than pmol/l in the adult healthy volunteers in this laboratory. TRH (2 mg i.v.) decreased plasma beta endorphin level to 6.3 plus minus 1.49 pmol/l at 120 min in the spinal cord-injured. In conclusion, opioid antagonists, naloxone and TRH hold promise in facilitating detrusor contraction in patients of both acute and chronic spinal cord injuries. Diuresis renography was performed in 37 patients (41 kidneys) who had equivocal pelviureteric junction obstruction. The non-obstructive pattern (Type 1 and 3a) was observed in 26 cases, the obstructive pattern (Type 2) in 7 cases and partial obstruction (Type 3b) in 8 cases. None of the cases with a type 1 response worsened, while all the cases with a type 2 response were found to have pelviureteric junction obstruction. Cases with a type 3a response needed no surgery-except one who worsened to type 3b, another who had calculi and one with persistently severe symptoms. 50 per cent of the type 3b response group required surgery. The diuresis renogram is a simple, safe, accurate and non-invasive method of investigation in cases of equivocal pelviureteric junction obstruction. The recommendations are- no surgery for response 1, pyeloplasty for response 2, follow up for type 3a and 3b and surgery if complications arise. Aspiration biopsy Cytology was performed in 95 patients with prostatic nodules detected on rectal examination. A simplified technique was used, dispensing with the need for any specialised instruments. The cytological diagnosis was compared with the histological diagnosis of tissue obtained either by core biopsy or at operation. The sensitivity and specificity of aspiration cytology was found to be 92.7 percent and 95.5 percent respectively. The predictive value of a positive cytological result was 95.0 percent. It was found to be a simple and safe procedure. Yielding a quick diagnosis and was without significant complications. Xanthogranulomatous pyelonephritis is an infrequent entity, usually diagnosed by gross or histopathological scrutiny. This is a report of 8 documented cases of xanthogranulomatous pyelonephritis, with associated monoclonal gammopathy as a special feature in one case. At present the non-scholastic abilites such as human relationship, moral reasoning, creativity, initiative, leadership qualities, decision making etc. are being neglected in the M. Ch Urology residency programme, as compared to scholastic or technical abilities. The noncognitive personal attributes have been shown to be better predictors of academic as well as vocational success than only the cognitive abilites. The present method of evaluation of the former qualities, if it exists at all, suffers from major shortcomings such as lack of objective assessment, and failure to use the assessment as a motivating tool. An objective methodology for the self-assessment of nonscholastic abilites is suggested for the continuous monitoring and development of non-scholastic behaviour in urology residents. 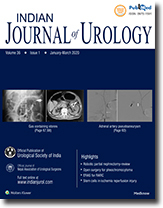 such an assessment is expected to reveal indirectly the lacunae, if any, in the urology department/institution, pointing thereby towards precise remedial measures to be instituted promptly so that urological administrators, teachers and residents can mutually continue to strive for standards of excellence, consequently reflected as improved total performance. Diagnostic female cystoscopy under local anaesthesia was done in 55 cases, using a frusemide-induced diuresis to provide the necessary bladder distension with the patient's own urine. The comparison with a control group using standard water cystoscopy reveals that frusemide-cystoscopy is better tolerated by the patient, who suffers significantly less pain during the procedure. The combination of Trimethoprim with Sulphadiazine was tried in 100 patients with urinary tract infection. A cure was achieved in 85 percent of the cases with E. Coli infection, with a 10 day regimen. A 20 day course was necesary in the case of Klebsiella. A 31-year-old male was diagnosed to be suffering from a vesical pheochromocytoma and a successful partial cystectomy was performed, the case being followed up for 30 months. Microscopically, the tumour tissue was seen to contain cells with a abundant granular, eosinophilic cytoplasm, resembling oncocytes. Ultrastructurally, the predominant cells were those with a deeply eosinophilic, granular cytoplasm, which contained a large number of mitochondria and very few catecholamine granules, these strongly resembled oncocytes. A case of uretero-uterine fistula was diagnosed preoperatively by radiography and successfully treated with a ureteroneocystostomy. Soft-tissue sarcomas constitute an important group of malignant tumours in children and teenagers. A case of a young patient with a fatal rhabdomyosarcoma of the perineum is described.